If you’re like me, and every other woman on the face of this earth, you get a bit squeamish as swim suit season approaches. I don’t know about you guys, but, for me, trying on swim suits is one of the most horrifying experiences, ever! Well, I certainly don’t have all the answers to make swim suit season more enjoyable, but I definitely have a way to help you shed a few pounds while promoting healthier eating habits for the future: The 5 Day Turkey, Berry & Yogurt Diet. Sounds delicious right?! Yeah, it actually is! I mean, I’d be lying if I said I wasn’t ready to head to the nearest forest to punch every turkey square in the face around day 3, but it worked like a charm, and the results are long lasting. Here’s what you do: for five days, all you’re eating is turkey, berries and yogurt. Now, there are some modifications allowed. For example, I added low fat, organic granola to my yogurt, and added spinach leaves and sun dried tomatoes to my turkey. This just made it less blah and made me feel like I was actually eating normal meals. As far as the berries go, there are no rules. Go crazy here! I used blackberries, but I think the next time I do it, I’ll add a medley of blueberries, blackberries and raspberries. For the yogurt, I used Yoplait LightVanilla Yogurt. 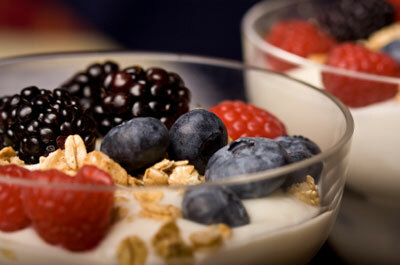 As an added treat, I decided to combine the yogurt, berries and granola and eat them together as a parfait. You’re probably wondering how this works, right? Well, all three of these ingredients provide your body with everything it needs, and nothing it doesn’t. Basically, you’re living on basic essentials, thus ridding your body of built up junk. Be sure to drink lots of water during this diet, as it will assist you in releasing toxins. Also, I didn’t mention this earlier, but water is all you’re allowed to drink. No coffee, no diet soda and no juice… I know, I know… the thought of going without coffee is enough to drive me crazy too. But, just keep in mind the end results, and I promise, it’ll be totally worth it. During this five day diet, I lost five pounds; which was so great, but that’s not even close to being the best part! The best part about this diet is the lasting results. By tricking your body into surviving on only the essentials for five days, you’re shrinking your stomach. This makes you feel fuller, quicker and puts a stop to overeating and binges. Before starting this diet, I was eating around 1700 calories a day in order to feel full and satisfied. Since finishing the diet, I feel full after consuming only 1300 calories per day; that’s 400 calories a day, people! I did this diet a couple weeks ago, and was waiting to blog about it so that I could get a real feel for the long term results. I can safely say that I am amazed by the results of this diet; it’s so great! I plan to do this diet once every 6-8 weeks to keep my body healthy, cleansed and satisfied. Is there a rule on how much of it you can eat? I think this is a great idea! I've wanted to try other sort of detoxes or cleanses, but they were all so boring and left me still feeling hungry. I've just started on Day 1 of my cleanse, but I've tweaked it to where I know that I won't get bored with it or give into other cravings. I'm allowing any fresh or frozen fruits and veggies, turkey, greek yogurt, green tea, milk, WATER, salmon, and maybe, just maybe some plain almonds if I'm not feeling satisfied. That's a good idea! Customizing your cleanse is a great way to find what works for you; that's how I came up with this one! Plain water is a bit boring to me. Would propel be a suitable alternative? I think Propel would be okay, provided there aren't a lot of additional calories associated with it! I often add lemon and lime to my water because I think plain water can get a little bland from time to time as well! Thanks for commenting! Also, could the berry be cherries or only things with berry in the name? What kind of granola did you use? Sadly, no coffee is allowed. I had a hard time with that part as well, but I found that drinking my water ICE cold gave me a spurt of energy in the morning. If you absolutely must have coffee, I'd say one cup of black coffee in the morning would be okay. Just be sure to drink extra water to flush it out of your system! I chose berries because of their antioxidants and because they work wonders in eliminating belly fat. So, if you could find a particular type of cherry that has antioxidants, I think that would be an acceptable substitute! What about ground turkey, is that allowed or just deli meat? Do you eat the turkey cold or heat it up? this post. I will likely be coming back to your weblog for more soon. place іn advance! I bookmaгkеd it. I'm now not certain whether this submit is written through him as nobody else know such targeted about my trouble. You are wonderful! Thank you! I am actually drinking water that is a detoxing water. It has sliced grapefruit, sliced oranges, sliced cucumbers & mint leaves. Is that ok to drink with this diet? Is this a diet that you created on your own or did it come from a book? I definitely have a way to help you shed a few pounds while promoting healthier eating habits. Find it out on my webpage that what it is!!! Thanks For Sharing a Wonderful Information about The 5 Day Turkey, Berry & Yogurt Diet . Hope you are a yogurt lover and for that FAMILY YOGURT always with you.